Despite initial opposition both within Umno and MCA, Tun H.S. Lee was one of the key leaders who persuaded the two communal parties to create a coalition that has since governed the country. TUN Lee Hau Sik is generally credited with initiating in 1952 an UMNO-MCA electoral alliance that marked the start of an enduring inter-ethnic coalition, a partnership which soon included the Malayan Indian Congress (MIC) and which led Malaya to independence. Lee’s other major role was in helping to set up the Malayan Chinese Association in 1949. Lee later represented the MCA in constitutional talks, and was the only Chinese signatory to the independence agreement concluded in London in 1956. The 1952 electoral alliance signed by Lee and Datuk Yahya Razak of Umno to contest the KL elections was one in a remarkable sequence of events that persuaded two communal parties to set aside their wariness of each other to create a coalition that has since governed the country. There was initial opposition both within Umno and in the MCA leadership to the move. Some in the MCA leadership favoured working with the non-racial Independence of Malaya Party (IMP) of Datuk Onn Jaafar. But it was Lee who argued strongly for partnership with Umno on a basis of parity. First Finance Minister: Lee having a discussion with Tun Tan Siew Sin, the man who would take over from him as Finance Minister in 1959. With independence in 1957, Tunku Abdul Rahman appointed Lee as Malaya’s first Finance Minister. On his retirement in 1959, Lee started the Development and Commercial Bank which in 1984 became Malaysia’s fifth largest bank. Two of his sons went into politics. Datuk Douglas Lee contested successfully the 1952 KL elections and Datuk Alex Lee was briefly in MCA and later a deputy minister representing Gerakan. Lee was the only major leader of the independence movement not born in Malaya. Unlike most immigrants, Lee came from a wealthy family in Zhenlong, Gaozhou, south China. The family business of Kum Lun Tai was in silk trade, remittance, and mining, and had offices in Hong Kong and Singapore. Lee studied at Queen’s College in Hong Kong and completed Law and Economics at Cambridge University. He then worked briefly in Hainan and with the P&O Bank in Hong Kong. In 1924 he came to Kuala Lumpur on family business. The family had acquired some tin mines. Soon after his arrival Lee bought more mines, this time for himself, and stayed on. Lee adapted quickly to Malaya and was active in the guilds and clan associations. He helped form the Kwantung (Guangdong) Association, Chinese Mining Association, and the Chinese Chamber of Commerce. When Japan invaded China in 1937, Lee headed the Selangor China Relief Fund in support of China. Lee was known for his association with China’s Kuomintang Party. In 1941, when war broke out in Malaya, Lee and his family evacuated to India. He met Chiang Kai-shek, China’s President, in Congqing, China. Knowing of his Cambridge background and close association with the British, Chiang appointed him a colonel and, in that capacity, Lee liaised between the British and Chinese armies along the China-Burma border. After World War II, Lee was appointed to committees entrusted with rebuilding the Malayan economy. And before long, he was helping to set up the MCA. 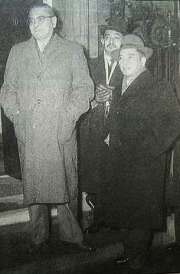 Set for historic talks: (From left) Tunku, Tun Dr Ismail and Lee about to enter 10 Downing Street, the British Prime Minister’s residence, in London in January 1956 for the independence talks. Already, in 1943 Tun Tan Cheng Lock had talked about the need for a Malayan Chinese organisation. The MCA was formed at what were probably the most troubling times for the Chinese. The community was still recovering from the difficult and at times dangerous years of the Japanese Occupation. Now in 1948 they were caught between an armed rebellion that was communist-led and a colonial regime seen increasingly as pro-Malay. Nearly half a million people, mostly Chinese, were being resettled in the New Villages. Many Chinese saw an urgent need, therefore, to have a party to rally the community and to represent them in constitutional discussions that were expected. In the meanwhile Sir Henry Gurney, High Commissioner of Malaya, was anxious that there should be a party to represent the Chinese in the coming political transition. More importantly, the British wanted anti-communist Chinese to help fight the MCP-led insurrection. Among such leaders was Lee, strongly anti-communist who in 1946 had started the China Press to counter the pro-left People’s Voice which was then the only local Chinese newspaper. In December 1948, Gurney saw Lee who then arranged for the High Commissioner to meet 16 Chinese members of the Federal Legislative Council. Gurney assured the Chinese legislators that the British supported the forming of a Chinese organisation. For several weeks then, Chinese guilds and associations all over the country held gatherings to select delegates to the inaugural meeting. Lee was elected to lead the Selangor delegation. At a gathering on Feb 27, 1949 the MCA was formed and Tan Cheng Lock was elected president. In the subsequent months, the party was preoccupied with welfare work in the New Villages where a third of the Chinese population had been resettled. Local elections were held for the first time in 1951 as a preparation towards eventual self-government in Malaya. The KL elections on Feb 16 1952 drew most attention not only because it was the capital but also because the IMP was contesting and expecting to make a major impact. The IMP appeared formidable, having on its side Datuk Onn Jaafar, former founder-leader of Umno, and Tan Cheng Lock, founder-leader of the MCA. Several Umno and senior MCA leaders including Tan Siew Sin, Khoo Teik Ee and Yong Shook Lin were with IMP, and it was also backed by the MIC. Umno and MCA decided to contest. This was MCA’s first experience in elections while for Umno its Penang performance where it won only one seat had not been inspiring. Lee, head of Selangor MCA and Datuk Yahya Razak, chairman of Umno KL elections committee, reached an electoral pact to have a single slate of candidates. For although KL had a large Chinese population, MCA’s manifesto declared that “the interests of the members of the other communities should also be represented”. For Umno, Chinese support was needed to defeat the IMP, its main rival. Essentially a local initiative, the electoral pact drew strong criticisms not only from IMP but also from MCA and Umno. Yahya Razak’s own division head Datin Putih Mariah resigned on Feb 10, just days before elections in protest at the pact. Two senior MCA leaders, Tan Siew Sin and Khoo Teik Ee, the party’s honorary treasurer, declared that MCA’s central working committee had not approved the Umno-MCA merger and in their campaigning for IMP singled out Lee for attacks. In the end the Umno-MCA alliance defeated the IMP by winning nine of the 12 seats. The results were a major boost to the new alliance and marked the beginning of IMP’s end. Lee favoured expanding the Umno-MCA alliance. In the weeks after the KL elections, Lee was in contact with Tunku Abdul Rahman, the president of Umno. The Tunku was the first to congratulate Lee on the KL results. 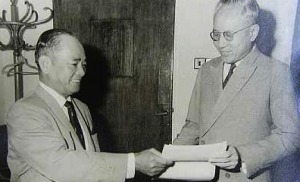 On Feb 22, Lee informed Tan Cheng Lock that the Tunku was agreeable to enlarging the alliance. Meanwhile, Lee was worried at the continued association of Tan with the IMP. On March 3, 1952 he informed Tan that senior and influential MCA state leaders had expressed deep concern at Tan’s calling of an inaugural Malacca IMP meeting and feared that he might be made state IMP chairman while still a leader of the MCA. Tan, on his part, continued to be cautious about an Umno-MCA alliance. He believed that several important issues had to be resolved before agreeing to Sino-Malay collaboration. Tan and other mainly Western-educated MCA leaders embraced Datuk Onn’s non-racial IMP and saw it as moderate in approach compared to Umno. In particular, Tan remembered Datuk Onn’s willingness to stake his position as Umno president by insisting on liberalising citizenship requirements and opening Umno to non-Malays. They were, on the other hand, unsure of Tunku who took over Umno in August 1951. Unwilling to abandon Datuk Onn and the IMP, Tan proposed giving MCA branches the right to work either with IMP or Umno. Speaking to the press on Feb 18, 1952, Tan declared: “I support the principle of IMP-MCA-Umno cooperation”. To Lee on Feb 22, he explained, “You are materially aware that influential members of the MCA want cooperation with IMP. So probably the MCA is divided on this question”. Umno, which regarded IMP as its main rival, would certainly not have accepted Tan’s proposition. And neither did Lee and the more politically conservative Chinese. Writing to Tan on March 1, 1952 Lee revealed that the Tunku indicated to him privately that he accepted the jus soli principle although there was a minority within Umno strongly opposed to such a concession. It might have been, as some writers had suggested, that Lee preferred an Umno-MCA alliance because he and Datuk Onn were not on good terms. But in fact correspondence at the end of 1951 showed that there was cordiality between the two leaders and even after IMP’s inaugural meeting, Datuk Onn again invited Lee to join IMP. Lee’s stand was more likely influenced by his identification with groups in the MCA who were worried about the future of Chinese education, language, and citizenship. These groups believed that the Chinese were politically weak and divided, and a distinctly Chinese party was therefore needed to safeguard the community’s interest especially at a time when British policies were interpreted as anti-Chinese. They therefore believed that MCA’s future could best be pursued by retaining its identity, and therefore an alliance with another communal party like Umno was a more workable option. Lee also learnt that Datuk Onn was a signatory to the Majority Report on the Immigration Ordinance of 1950 which he deemed unfavourable to the Chinese. On March 5, Lee alerted Tan to the report, soon to be presented to the Legislative Council, and he questioned the sincerity of Datuk Onn’s multi-racial claims. Eventually, Tunku and Tan Cheng Lock met on 18 March and Lee joined them for dinner discussions. After several more rounds of talks involving other leaders, a nation-wide Umno-MCA alliance was institutionalised. The electoral alliance in 1952 was an important start to meeting British insistence that there must be inter-ethnic cooperation before discussion of independence. But more importantly, when independence talks were held leaders of this new political alliance were ready to agree to major compromises over contentious matters so as to achieve a united front. Thus Lee together with Datuk Yahya Razak, started what later came to assume a political mystique – an inter-ethnic coalition that won independence for Malaya and created Malaysia. The Founding Fathers series is coordinated by Dr Joseph Fernando of Universiti Malaya, Kuala Lumpur, and Research Editor Dr Lee Kam Hing (leekh@thestar.com.my).